Improve your indoor air quality with your newest 3Q® 5-STAGE Air Purification System. 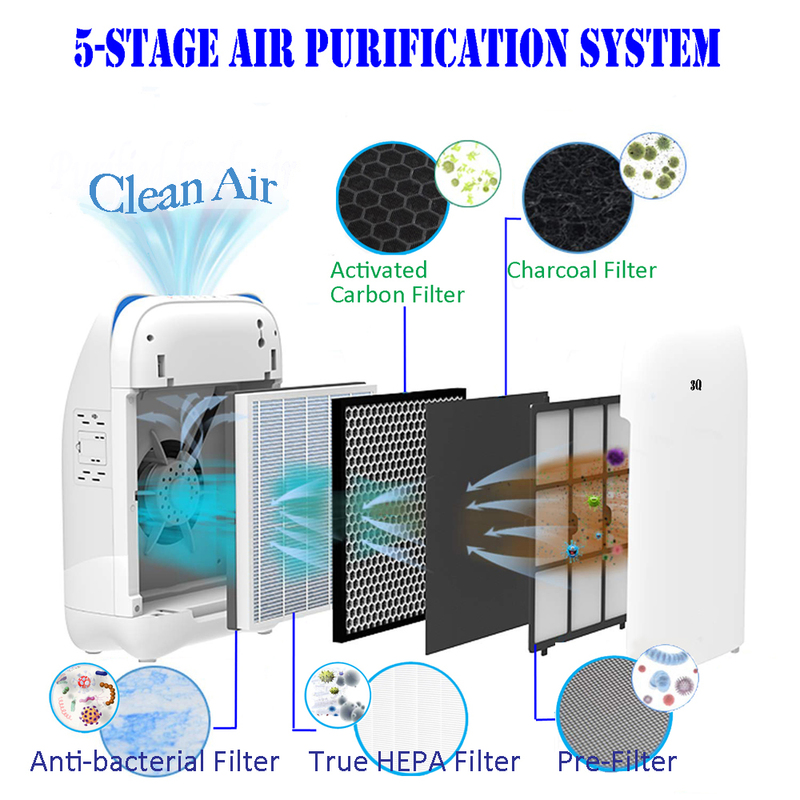 Multiple levels of cleaning include a combination pre-filter, True HEPA filter, a Charcoal filter and an Activated Carbon filter, Antibacterial treatment technology creates a healthy environment to breathe easier and live better. Featuring a Air Quality smart sensor to control the air quality automatically and stylish design with a footprint the 3Q air purification system fits in well in rooms or office up-to 220 sq.ft. This air cleaner features touch panel with intuitive LCD display, a filter replacement/clean indicator and 4 fan speeds. Backed by a three years warranty the 3Q is a quality purifier that offers peace of mind. Captures large dust and allergen particles, hair and pet dander. 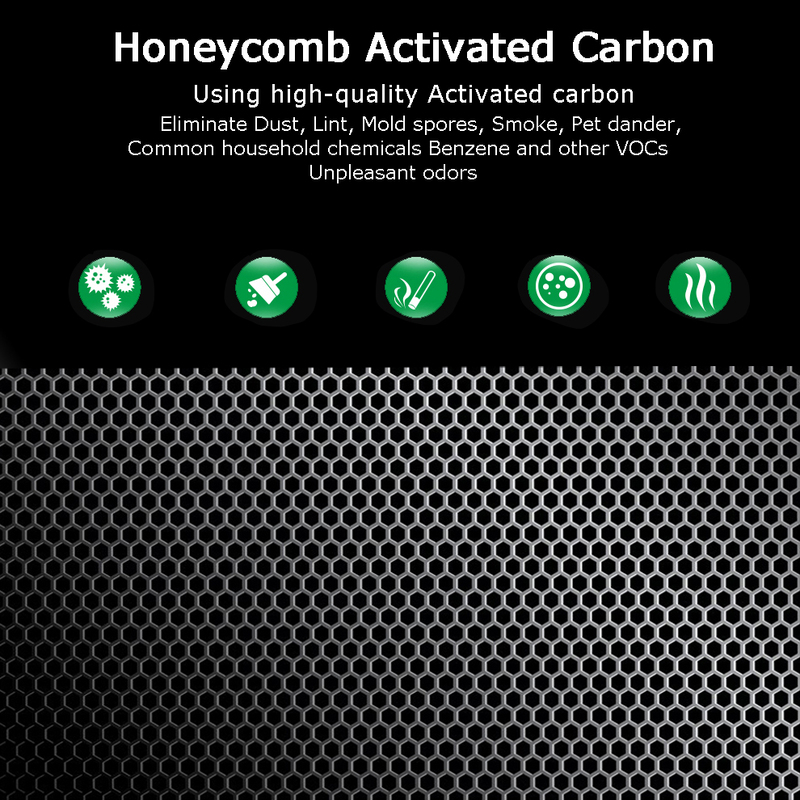 A High-Efficiency True HEPA filter enables the purifier to capture dust, allergens and other solid particles. Effectively removes up to 99.97% of airborne pollutant particles that pass through the system. This includes contaminant particles such as pollen, bacteria, dust mites, viruses, smoke, and other airborne impurities as small as 0.1 microns. 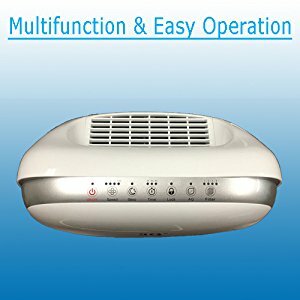 Unique low air flow resistance technology makes the air purifier more powerful and effective. Antibacterial treatment technology removes air borne bacteria, kill germs. Touch Control Panel for your convenience. LCD display - Timer, Filter replacement/clean Indicator, AQI and fan speeds. Ultra - silence operation at night. 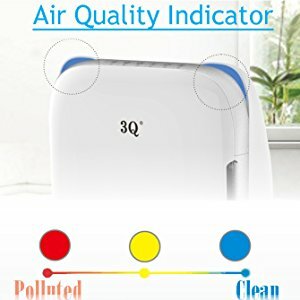 AQ (Air Quality) smart sensor keeps track of the air quality in your room and will automatically adjust the fan speed if operated in auto mode. Safer design to avoid mistake operation of Children. Allows you to set the length of operation from 2 hours, 4 hours or 8 hours. 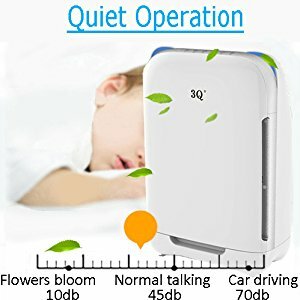 The Air Purifier does NOT produce any Ozone. It does NOT USE UV-C LIGHT and negative ions generator. The air purifier will stop operating if the cover is open. The AP-300H True HEPA AIR PURIFIER has received safety certifications from ETL, GS and CE. Made of durable materials.
. Control the air quality automatically in Auto Mode.
. Keep track of air quality in your room and automatically adjusts the fan speed.
. Air Quality Indicator lets you know the air quality by changing colors. 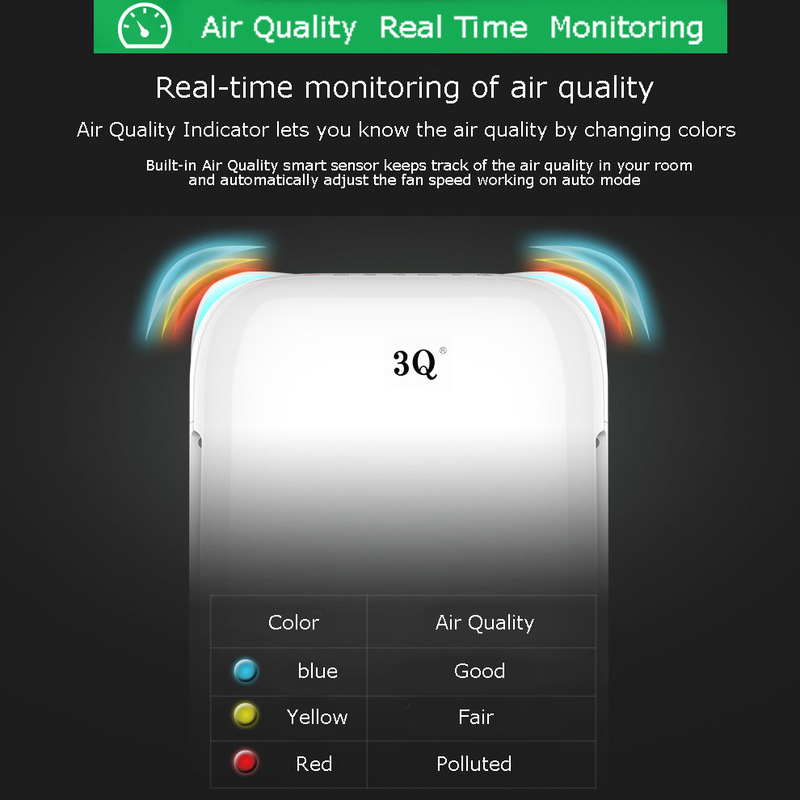 Three different colors show air pollution level.
. Manually operated three fan speeds plus Auto mode and Sleep Mode.
. Dust Sensor automatically monitors, detects, and responds to the particles in your air.
. Replacement filter indicator and built-in timer with auto shut off.
. Ultra-silent operation at night.
. Equipped with the highest quality reliable fan motor and powerful Open Type Turbofan.
. Produces a strong airflow with low noise.
. Improves air circulation while filtering out airborne particles. Powerful and whisper quiet performance. Improves air circulation while filtering out airborn particles. 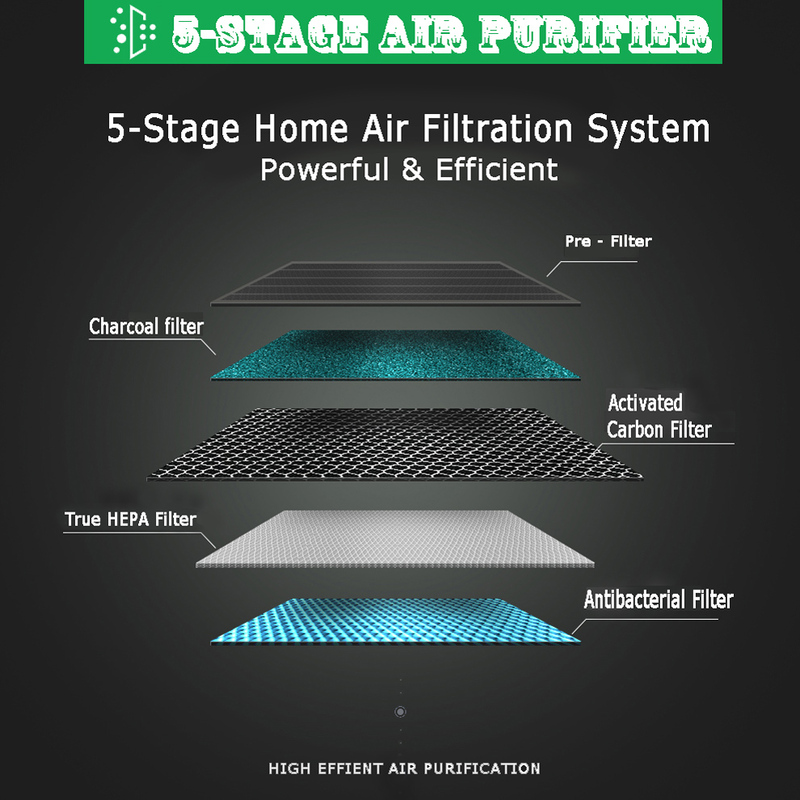 Five stages of powerful filters to purify the air. Dust Sensor automatically monitors, detects, and responds to the particles in your air. Air Quality Indicator lets you know it’s working by changing colors. Replacement filter indicator + built-in timer with auto shut off. It's great for smoke odours and your best defense against airborne chemicals and VOCs caused by wildfire smoke. And this air purifier also can monitor indoor air quality. 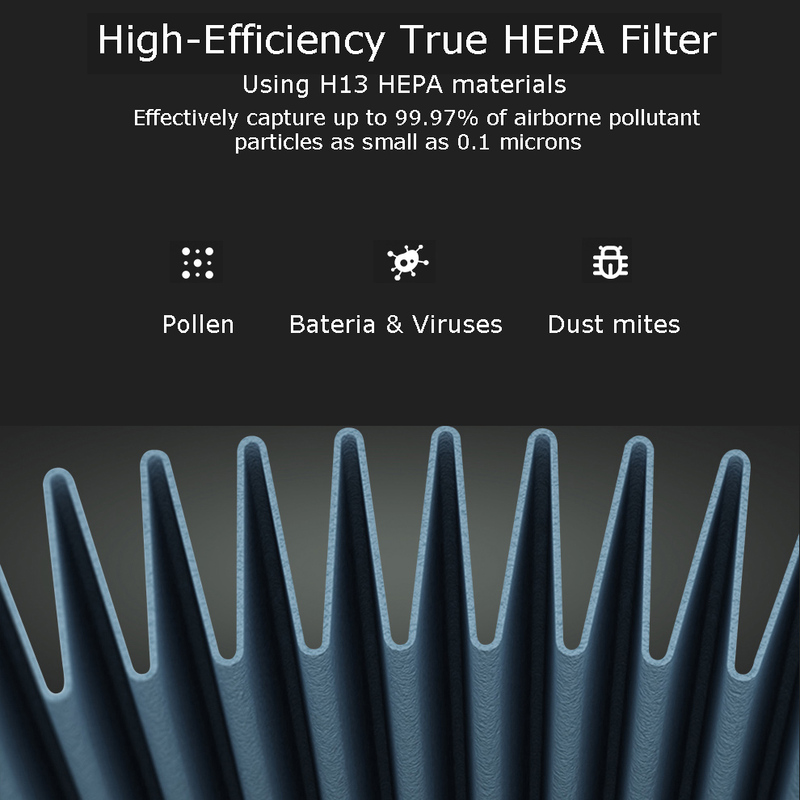 True HEPA filter efficiency: H13, 99.97% of airborne particles Like Pollen, Smoke, Dust As Small As 0.1 Micron. This air purifier is suggested for use in a single, closed room up to 220 square feet. 1 x True HEPA Air Purifier. 1 x Activated Carbon Filter. Note: Please remove the plastic bags of the True HEPA filter, Charcoal filter, and Activated carbon filter before running the air purifier. Failure to do so may cause damage to the unit. True or absolute HEPA filters are unlike other types of filers because they are required to remove small particles from the air that other filters are unable to remove. The HEPA standard requires that all true HEPA filters are able to remove 99.97 percent of airborne particles down to the size of 0.1 microns. They use a paper-like media and mechanical filtration designed to strain out almost all air impurities. The microscopic particle size standard is equivalent to a particle one-300th the diameter of a human hair, making them the most efficient air filters available. With the rise in popularity of HEPA filters came competitors offering a lower cost and similar product. 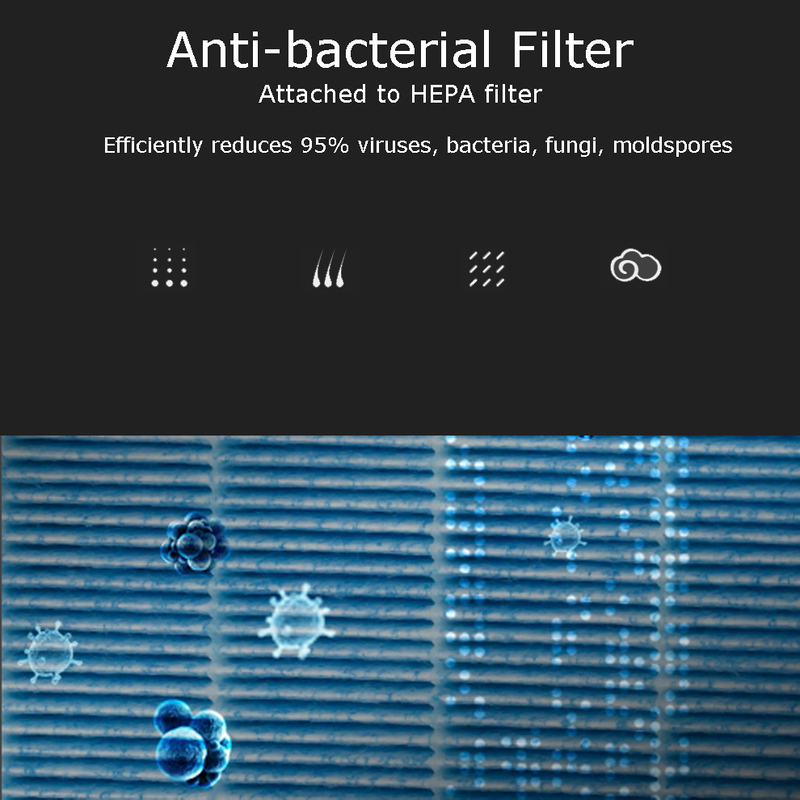 These “HEPA-type” filters work in the same way as true HEPA filters, but they do not adhere to the same standards. The major difference in the true HEPA and the HEPA-type filters are their efficiency for small particles. They are often limited to 85 percent to 90 percent of airborne particles, missing many of those that are smaller than one micron. We warrant this product to be free of defects in materials or workmanship commencing upon the date of the original purchase. Save your original sales receipt to validate start of warranty period. Click the button below to add the TRUE HEPA AIR PURIFIER 5-STAGE FILTRATION - Remove Allergies, Mold, Bacteria & Odors to your wish list.